Wampum is an Algonquian word that translates roughly to white shell beads. Historical wampum are small, cylindrical, white and purple beads. region where the shells used for making the beads were found. currency which required gold and silver not readily available in “the New World”. and the Creek and Cherokee in the southeast. The word for money in Cherokee is atela/atsela/adela (dialectic differences). This is also the word used for bead (Mooney, 488). the Creek, the Cherokee, exchanged strings or belts of wampum to solidify negotiations. by Cherokee women as a gift (and sign of peace) for the Iroquoian women (Perdue, 93). In towns of the Cherokee confederacy people gathered annually to hear the tribal orator, a priest who was sometimes called "the beloved man" recite the common law of the confederacy. "When the orator spoke the law", he was reading the meaning of history and tradition contained in the tribal wampum. 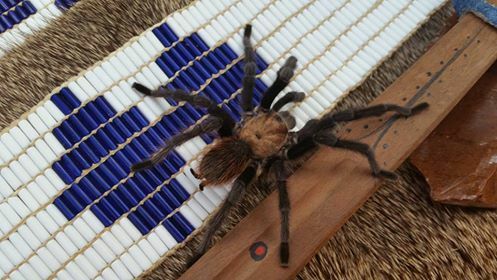 He held the ancient and sacred wampum belts in his hand. How do wampum belts function as material rhetoric? be translated for a particular meaning. message to be properly disseminated. validity of a belt’s message. their laws into a written and readable language. “In the ninety years between the adoption of the first written law (l808) and the abolition of tribal courts (1898) wampum was supplanted by more than a million pages of legal transcripts and printed material. By 1896 the Redbird Smith-Keetoowah movement of the Cherokees acknowledged that understanding of the wampum had been lost, and recovery of these ancient laws became one of the cornerstones of [traditionalist] revival". Duncan, Barbara. Living Stories of the Cherokee. Chapel Hill, NC: The University of North Carolina Press, 1998. Mooney, James. Cherokee History, Myths and Sacred Formulas. Cherokee, NC: Cherokee Publications, 2006. Perdue, Theda. Cherokee Women. Lincoln, NE: The University of Nebraska Press, 1998. Strickland, Rennard. Fire and the Spirits: Cherokee Law from Clan to Court. Norman, OK: The University of Oklahoma Press, 1982.